Ahead of the band's Australian tour in May, Cradle of Filth main man Dani Filth has announced that Australian extreme noise terrorists The Amenta will be the main support for the legendary outfit's East Coast run of shows, whilst in Perth the main support will from melodic death metal outfit Claim The Throne. Along with the main supports it has also been announced that Cradle Of Filth will be holding a competition to decide the opening band in each state. To enter head to www.facebook.com/KRBDE.touring to register band's details and best song. Bands must register their details through the purpose built Facebook application, which allows users to send a soundcloud link of their best song. The most suitable songs will be shortlisted and put to a public vote through the KillRockStar Entertainment Facebook page. The TOP 3 highest voted songs/bands in each city will then be presented to Dani Filth, who will pick the final winners to open the shows in each city himself! Registrations for bands close midnight Sunday 24th march. Like all truly extreme artists, The Amenta has long been defined solely by its refusal to be defined. Formed in 2002 by Erik Miehs (Guitars) and Timothy Pope (Noise and Fx), now completed by Cain Cressall (Vocals), Robin Stone (Drums) and Dan Quinlan (Bass), the band quickly realised that their interests pointed more towards experimentation and a stubborn refusenik attitude. After countless overseas tours and a slew of uncompromising album releases 2013 sees The Amenta release their latest aurally assaulting LP Flesh Is Heir. 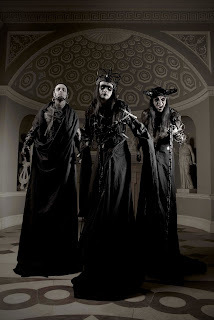 Known for their dynamic symphonic style of gothic black metal, along with the dark poetic lyrics from the hand of enigmatic front-man Dani Filth, Cradle of Filth formed in Suffolk in 1991 going on to become one of the UK’s most successful metal acts. Tickets on sale via usual outlets.